And so it is with the mass shooting yesterday at the Tree of Life Synagogue in the Squirrel Hill neighborhood — a Jewish enclave — of Pittsburgh, Pennsylvania. Eleven were shot dead, ranging in age from 54 to 97; the average age is 74. Note: The Tree of Life Synagogue is at 5898 Wilkins Ave, Pittsburgh, PA 15217. 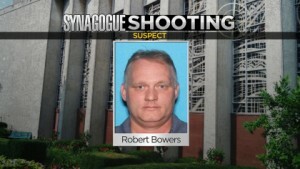 We are told that yesterday, at around 10 a.m., armed with an assault rifle and three Glock handguns and screaming “All Jews must die!,” Robert Bowers, 46, burst into the Tree of Life Synagogue during Sabbath services, shooting and killing at least 11 people and wounding a half-dozen more, including four police officers, before surrendering. This Google map shows that the Tree of Life Synagogue is a 7-minute drive from the Jewish Community Center where the active shooter drill took place in January 2018. The synagogue shooting is already used as a pretext to silence the Alternative Media, specifically Gab, a libertarian alternative to Twitter. Unlike Twitter, Gab does not censor speech, although Gab vehemently condemns acts of violence and terrorism.